The effects of climate change on agriculture are characterised by various forms of uncertainty. First, as previously mentioned, there are uncertainties concerning the rate and magnitude of climate change itself. Second, there are uncertainties around the biological response of agricultural outputs, for example with regard to CO2 fertilization. Third, there are uncertainties as to how society responds — or even has the capacity to respond — to projected and expected impacts. Some aspects of climate change research are limited by fundamental, irreducible uncertainties. Some of these uncertainties can be quantified, but many simply cannot, leaving some level of irreducible ignorance in our understandings of future climate uncertainty (Dessai and Hulme, 2004). Before highlighting some of the more important uncertainties inherent in understanding the impacts and sensitivities in agriculture, the point must be made that decisions will need to be made despite continuing uncertainty. The recently published Garnaut Review (Garnaut, 2008) in Australia highlights that uncertainty surrounding the climate change issue is a reason for disciplined analysis and decision, not for delaying decisions. A perceived lack of reliable predictions of future climate is sometimes argued to pose a major limit for effective adaptation to climate change. Often this argument is used to justify further investment in climate modelling capabilities in order to improve predictions of future climate (Hulme and Dessai, 2008). In an assessment of climate prediction and adaptation to climate change, Dessai et al. (2009) argue that society can (and indeed must) make adaptation decisions in the absence of accurate and precise climate predictions. Box 3.1 provides a description of how uncertainty is being tackled in the United Kingdom by the UK Climate Impacts Programme (UKCIP). Part of the reason why there are diverging estimates of temperature and other variables into the future is associated with not knowing accurately how the climate system reacts to unprecedented emissions of greenhouse gases, or not knowing how clouds, forest, grasslands and particularly the world's oceans react to climate perturbations and how they feed back into the system. This uncertainty surrounding future climate projections is often manifest in ranges of estimates for particular climate parameters (as shown in Figure 2.1). Recent research (Lobell and Burke, 2008) finds that uncertainties in average growing season temperature changes and the associated crop responses represent a greater source of uncertainty for future impacts than associated changes in precipitation. This is contrary to the widely-held assumption that improved rainfall projections would reduce uncertainties in projections of climate change impacts on agriculture. The relative contribution of precipitation, temperature effects, extreme events, CO2 fertilization effects, pests and diseases, solar radiation and the crop response to these factors is poorly understood. Box 3.2 provides a brief discussion of uncertainties associated with climate models. The United Kingdom's Climate Impacts Programme (UKCIP) is developing an up-dated set of scenarios to replace the current widely-used scenarios (UKCIP02). The new scenarios will create a large ensemble simulation of future global climate. The results of each model version will be weighted according to how well it represents current climate, and its recent evolution, and these projections will be used to build a picture of the probability of different climate outcomes. Single model results from other IPCC climate models will be incorporated to address uncertainties resulting from the structures of different climate models, and the results will be down-scaled to provide more details about the changes expected across the United Kingdom. For each emissions scenario, users will be presented with a probabilistic distribution of outcomes to explore the uncertainties. This probabilistic representation of uncertainty is the key innovation of UKCIP09. In addition to the scenarios, UKCIP provides a tool for supporting decision makers in identifying and managing their climate risk in the face of uncertainty. It is based on standard decision-making and risk principles and encourages users to consider their climate risks alongside their non-climate risks. As well as the framework, UKCIP provides guidance in the form of a technical report: Climate Adaptation: risk, uncertainty and decision-making (Willows and Connor, 2003). Changes in land cover, sometimes as direct response to predicted changes, may directly or indirectly feed back into the climate system. Research suggests that changes in land cover can provide an additional major forcing of climate, through changes in physical properties of the land surface (Denman et al., 2007; Pielke et al., 2002). Several studies have shown that changes in land-use such as deforestation, afforestation and the conversion of land to pasture or agriculture have the potential to affect the climate system (Chase et al., 2000; Betts, 2000). Afforestation is a widely cited mechanism for sequestering CO2 from the atmosphere, however in some cases afforestation could result in a positive radiative forcing, resulting in a net warming despite the removal of CO2 from the atmosphere (Pielke et al., 2002). This would occur, for example, in regions with significant snow cover becoming extensively reforested resulting in a lower surface albedo. Further examples include the potential release of carbon from soils under warming conditions, resulting in what was a carbon sink becoming a source. Drought and hydrological feedbacks associated with land-use change have a direct impact on the source or sink capabilities of terrestrial ecosystems. These issues create further uncertainty when attempting to understand the climate system and should be considered in land-use decision-making. Estimates of future climate change are generated by climate models which are mathematical representations of the climate system, expressed as computer codes. These models have been developed and refined over many years now. For some climate variables, such as temperature, confidence in the estimates is relatively high, while for others, such as precipitation, there is a lower degree of confidence. Climate models are based on established physical laws and a large number of observations. This provides a basis for confidence in their projections, as does the routine and extensive assessment and comparison of the simulations with real-life observations. 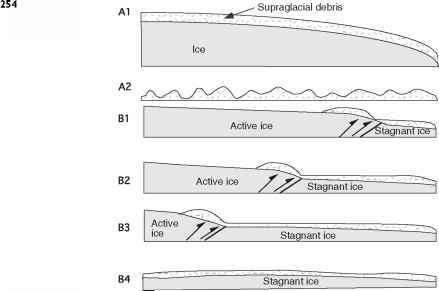 In addition, models have been used to simulate ancient climates and can reproduce many historical climate features and observed aspects of climate change over the past centuries over the time records available. There are therefore many reasons to have confidence in climate models. However, there are still significant uncertainties associated with some aspects of the models. Deficiencies regarding tropical precipitation, large-scale oscillations and the representation of clouds are some examples where limitations in scientific understanding or the availability of detailed observations lead to modeling errors. As a consequence, models display a substantial range of global temperature change in response to specified greenhouse gas forcing. Projections are thus presented as a range of values. Source: Randall et al. (2007). The greatest uncertainties in assessing impacts and responses are those associated with physical and biological processes, on the one hand, and of economic and social responses on the other. Climate model uncertainties translate into downstream uncertainties in projecting impacts of climate change. For the agricultural and water sectors inter-climate model differences in rainfall change, for example, represent a barrier to the effective use of climate change information for seasonal forecasting and other water users. In terms of biological and physical processes, agronomy and agricultural meteorology have invested heavily in research over the past decade to understand field-level processes that will affect agricultural productivity and yield. Great strides have been made to estimate the combined response of agricultural crops to changes in water availability, temperature and elevated ambient CO2 (now standing at 380 ppmv in the atmosphere compared to 270 ppmv in pre-industrial times). Most important agricultural crops exhibit higher rates of photosynthesis with higher ambient CO2. High CO2 also reduces transpiration per unit leaf area and hence may lead to improved water-use efficiency. Thus there are potential increases in yield from major crops from elevated CO2 on its own, as shown in Figure 3.1. But of course the higher ambient CO2 will also ultimately translate into changing climatic parameters - potential CO2 effects on plant biomass depend on the availability of water and nutrients (Parry et al., 2004). 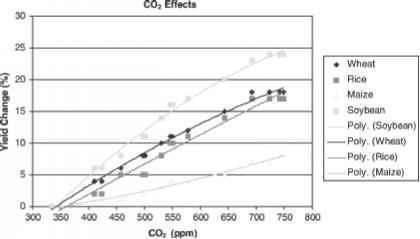 Hence, the positive impacts of elevated CO2 can only be realised if other parameters of biological productivity are not limited. Current research on agricultural impacts now takes on board these issues into underlying crop models (Parry et al., 2004; 2005). But emerging evidence from agronomic scale experiments of enhanced CO2 and ozone show smaller increases in yield than anticipated from the experiments reported in Figure 3.1, as well as large yield losses of around 20% for the major rice crops under elevated tropospheric ozone (also projected to increase along with CO2) (Long et al., 2005). The case is therefore made by some agronomists that many results on global food security depend on optimistic assumptions concerning yield and hence underestimate the impacts of climate change on production and on welfare. A further major issue is the availability of water for agriculture both for rain-fed and for irrigated systems. This is an area of greater uncertainty in the impacts of climate change than that of temperature change (or sea-level rise), with models needing to capture evapotranspiration, regional climates, albedo effects, and other feedbacks in the climate system in order to project precipitation rates (Arnell, 2003; Gordon et al., 2005). Around 1.4 billion people are already estimated to be living in countries deemed to be suffering from water stress, withdrawing more than 20% of the available water resources and having little room for manoeuvre or scope to increased irrigated area. This situation is likely to be severely exacerbated by climate change, which is projected to cause significant drying in areas already under stress. Arnell (2004) estimates changes in populations experiencing water stress. He uses a measure of water availability per capita (a threshold of 1 000m3 per capita per year) as the primary measure of water stress, rather than a measure of present or future withdrawals of water (perhaps more relevant for agriculture). Table 3.1 presents results for selected regions under two selected scenarios of climate from one well established model (HadCM3) and related socio-economic changes that represent changes in populations living in the regions and their location and settlement over time, as well as the rates of economic growth and the relative convergence of these rates in different parts of the world (for methodological discussion on these types of scenarios and on the detail of the so-called IPCC "storylines", see Berkhout et al. and Nakicenovic et al. ). Table 3.1 shows that there are significant changes in the number of people living with increased water stress, and in some cases living with decreased water stress, in many regions of the world. Changes in stress are also set as a threshold whereby stress occurs when the percentage change in mean is more than the standard deviation of the 30-year mean runoff (Arnell, 2004). Water availability is reduced by the 2050s in these scenarios of climate change in the Mediterranean, in parts of Europe, central and South America and in southern Africa. Clearly there are winners and losers in changing precipitation but the seasonality of precipitation is also extremely important. Greater intensity of precipitation events, such as those observed in the recent past in the United Kingdom (Osborn and Hulme, 2002), affect the changing incidence of floods and droughts. Table 3.1 also shows estimates of populations living in watersheds that are projected to have reduced water stress. But Arnell (2004) cautions that the increased runoff that produces this decrease in water stress (in southern and eastern Asia for example - Table 3.1) "may not be beneficial in practice because the increases tend to come during the wet season and the extra water may not be available in the dry season" due to lack of infrastructure to capture and manage this water for agriculture and other purposes. As with temperature and interacting effects, there are significant ranges in the estimates for water stress, compounding uncertain socio-economic and climatic futures. Nevertheless, a consistent picture emerges from Arnell (2004) and from similar studies (Alcamo et al., 2003; UNEP, 2001; Vorosmarty et al., 2000) - that water resources are likely to be more scarce in future due to climate change in regions already reaching critical thresholds, and that this scarcity will be compounded by changing seasonality and unpredictability in precipitation. Thus, agriculture will be competing for water as a scarce commodity in a warmer, more unpredictable world, where demand for agricultural outputs is higher due to parallel rises in global populations. The third area of uncertainty relates to societal response to the impacts of climate change on agriculture. Here the uncertainty is characterised less by unreliable data or accurate models, but more fundamentally on contested theories of how societies adapt, the role of agriculture in economic development, and the role of over-arching parameters of global politics and policy choice. Future greenhouse gas emissions are the product of very complex dynamic systems, determined by driving forces such as demographic development, socio-economic development, and technological change. The way that society responds to changes in climate, as well as other challenges, is highly uncertain. In order to accommodate this type of uncertainty, global scenarios of alternative futures bring these issues together in the Special Report on Emissions Scenarios (SRES) of the IPCC (Nakicenovic et al., 2000). Box 3.3 (further below) describes the main assumptions underlying each family of scenarios. The scenarios are built on underlying model drivers that attempt to model global population projections and potential futures that attempt to analyse future worlds where, for example, free trade and global market integration occur, while in others, regional development and high environmental degradation drive policy choices (see Nakicenovic et al. ; Schiermeier ; and Grubler et al.,  for discussions of the controversies surrounding these scenarios). Notes: All results reported use the HadCM3 climate model and the IPCC SRES A1 and B1 storylines. Other models give diverging estimates for both increased and decreased numbers. Increased water stress is defined by a change to per capita water availability to below the threshold of 1 000 m3 per capita per year. Reduced water stress is defined by a change to per capita water availability to above the threshold of 1 000 m3 per capita per year. 20th century without apparently having major reserves or resources to invest in new livelihood sources (Mortimore and Adams, 2001). Similar evidence is emerging on adaptation in southern Africa (Thomas et al., 2005). All these changes occur despite increased impacts and the scarcity of natural capital and even reduction in ecosystem services (both observed and projected [e.g. Schröter et al., 2005, for Europe]). Uncertainty in the science of adaptation stems more from contested underlying theories of behaviour, politics and risk than from data and observation (Adger and Vincent, 2005). There is debate, for example, on what constitutes the capacity of a sector, region or country to adapt to climate change - are the elements of adaptive capacity generic and related to levels of economic development, or are they specific to climate risks faced? Adaptive capacity is a vector of resources and assets that represent the asset base from which adaptation actions and investments can be made. This capacity may be latent and be important only when sectors or systems are exposed to the actual or expected climate stimuli. Vulnerability to climate change is therefore made up of a number of components including exposure to impacts, sensitivity, and the capacity to adapt. Adaptive capacity has diverse elements encompassing the capacity to modify exposure to risks associated with climate change, absorb and recover from losses stemming from climate impacts, and exploit new opportunities that arise in the process of adaptation. Adaptation decisions taken by individuals (e.g. to use insurance, relocate away from threats, or change cropping patterns or seeds) take place within an institutional context that can act to facilitate or constrain adaptation. Some adaptation by individuals is undertaken in response to climate threats, often triggered by individual, extreme events (Reilly and Schimmelpfennig, 2000). Other adaptation is undertaken by governments on behalf of society, sometimes in anticipation of change but again, often in response to individual events. Government policies and individual adaptations are not independent of each other - they are embedded in governance processes that reflect the relationship between individuals, their capabilities and social capital, and the government. These ideas are elaborated in Chapter 4.